"Okay," some might say, "Utilitarianism may be poison in politics, but what about i our personal lives? If we restrict this theory to individual decisions, surely what brings happiness for the largest number of people must be right." When Granny is in a nursing home, having lost her marbles, and lies in bed drooling all day, what shall we say? Granny has no real quality of life. She demands constant care. Constant care is expensive. Is it not more merciful (and cheaper) to simply assist her to her final journey home? She will die soon anyway. Is it not better for all the rest of the family, indeed for all the rest of society for Granny to go? It never in a million years would have occurred to me that a great motivation behind the euthanasia movement is efficiency. Or, to be more accurate, Utilitarianism. Indeed, part of the motivation actually is misplaced kindness. But the rest ... yep ... it is Utilitarianism. There is a great comfort in knowing what to call something. In having a definition on which to hang ideas that you have encountered. It helps clear the mind, helps one wrestle with new concepts, and helps one evaluate the truthful inherent in the concept. For everyone who has ever had a discussion where they were left grappling someone pushing an idea that they knew wasn't "quite right" but weren't sure exactly why ... I present the cure: Disorientation: How to Go to College Without Losing Your Mind. Now, I have no idea if you can get a college student to read this book but if you've got one it is sure worth a try. For that matter, it is worth getting just to sit yourself down with it and get your own education up to date. I was darned glad to be working my way through it at about the same time that it fell to my lot to read God is Not One. I knew there was a lot wrong with it but I wasn't sure what exactly to call some of it until I was reading some of these essays. Let's face it. Chances are that your child has been exposed to these ideologies long before heading off for college. Most of those ideas are communicated through television, movies, and pals who they see every day. Talking about these things intelligently at home is the best way to make sure that everyone understands just why what the Church teaches is true and where those other ideas have skewed truth. 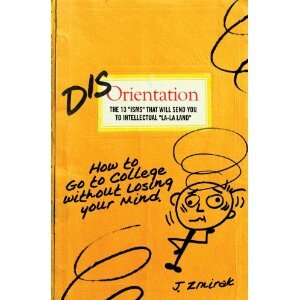 If your kids are going to college, sure go ahead and get them a copy. But you don't have to wait that long. Get a copy for yourself now. And one for the kids ... no time like the present when it comes to understanding how our culture thinks versus how the Church does. The sentimentalist, anxious to denounce and to distance himself, does not stop to consider that the great reformers withing the Church—St. Francis, St. Teresa of Avila, St. Catherine of Siena, and others—did not flounce away from what was difficult. They remained, and the profound insights gained through their struggles have instructed and enhanced the "worthy idea" of faith. Dismissing it all with a few overused buzzwords, a sentimentalist runs his premium brain on the cheap and inefficient fuel of superior feeling but he cannot be accounted a thinker who enhances understanding. And his destination is up for grabs too. The temptation to lapse into feeling-over-thinking is not unique to our century; it is simply the product of what we might call "Evian reasoning." ... reasoning that resembles the thought processes of Eve in the Garden, at the very infancy of human wondering. What sounds good and looks good must be good and so we should have it, despite arguments to the contrary or "arbitrary" rulings by an Authority. Eve allowed her imperfect reason to be subdued by her feelings and desires, and thus she took the world's headfirst dive into the waters of Sentimentalism, which—while shallow—are deep enough for infants to drown in. Note: one of those top Catholic writers is Elizabeth Scalia. Better known 'round these parts as The Anchoress, she wrote the chapter on sentimentalism (and a mighty fine job she did of it, too, as you can see from the bit quoted above). She gave me this review copy, which I would have pushed on y'all even if I'd bought it with my own money. Great review! I've been thinking of snagging a copy of this book ever since I saw the list of contributors. "I have no idea if you can get a college student to read this book but if you've got one it is sure worth a try." There are plenty of thoughtful Catholic college students out there, working towards holiness and apostolate amidst the mainstream college culture. Just saying. But getting them to read these essays would have been a real chore. Some of those thoughtful students also would rather read Vampire$, which has plenty to say on the subject as well but in an easier to take form when already piling on the schoolwork. On the other hand, it would not really have been necessary. We covered it in dinner conversations over the years.